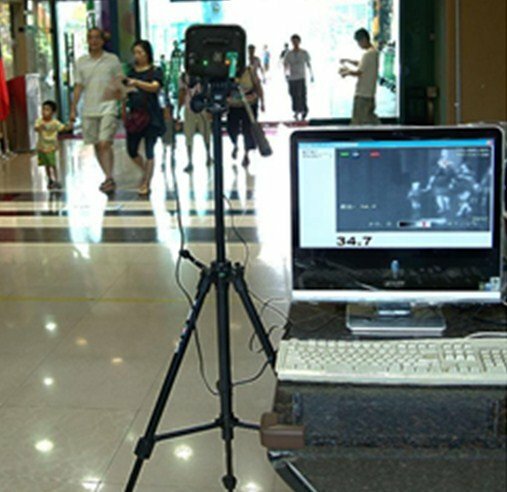 Instantly synchronized display of the thermal imager like the picture on the PC screen . When the thermal imager to detect more than a high temperature : with two different warning sound , you can set the body fever warning sound and warning sound outside fever over the body ( such as hot coffee and hot food ... etc) . Flashing red warning , digital temperature display characters , a warning sound from the PC speaker . Thermal imaging screen automatically according to date for the file name is automatically saved every minute JPG files. 1. Using a high -resolution 384x288 Uncooled microbolometer sensor . 5. System manufactured in Korea. Using top-quality Samsung chips. 2. The immediate area is displayed in A non-contact thermometer the temperature of the screen containing the maximum temperature value. 3. The thermal image temperature data detection rate : 50 Frames / second @ 384x288 mode. 4. The maximum temperature data synchronization displayed on a computer screen. Issued a warning sound and flashing yellow warning when the temperature exceeds the maximum value . 6. You can set an alarm condition occurs when a high temperature , thermal imaging screen automatically when the date in accordance with the minutes and seconds for the file name is automatically saved JPG files. 7. Compatible with Windows 8 / Windows 7 / Vista / XP / NT / 2000 systems. 8. The software required functionality including online instructions . A key thermometer connection can be used. Including mouse , speakers , Ethernet connection interface .